An outdoor pool and a fitness room are among the amenities at the Comfort Inn Horn Lake which is situated in a location with quick interstate access. The three-story Comfort Inn Horn Lake offers 49 rooms with coffeemakers work desks hairdryers microwaves and mini-fridges. Internet access is free and a complimentary breakfast is served. The hotel has a seasonal outdoor pool a fitness room and a guest laundry. There's a guest-use computer with internet access as well as on-site copy and fax services. Pets are welcome for a fee. Non-smoking rooms are available. Parking is free. The hotel is located off I-55/I-69. Baptist Memorial Hospital-Desoto and the Desoto Civic Center are one mile away. It's six miles to Graceland. Memphis attractions including the Memphis Zoo FedEx Forum and Beale Street are approximately 20 minutes from the hotel. 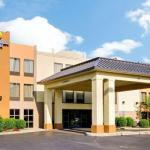 The hotel is six miles from Memphis International Airport.